Direct-selling company Thirty-One Gifts announced it is offering its first baby-style pattern available on select products in September, as well as new baby-style personalization designs. Thirty-One is offering three products in its new baby print, including this Zip-Top Organizing Utility Tote. Many of the company’s bags, totes and accessories commonly are used as baby bags and auxiliary storage for bottles and baby necessities, and their bags have been voted best diaper bag by readers of the BabyCenter blog in recent years. None of their bags, however, have been available until now in a baby-style print. The infant print will be offered during September only, and the personalization – three icons that can be embroidered onto Thirty-One’s products – will be offered through January 30, 2018. The new print is available on three products – the Zip-Top Organizing Utility Tote, which functions as a baby bag and features seven pockets and a zipper closure; the Super Swap-it Pocket, an organizer that fits inside the tote and has zippered and open compartments for holding diapers and supplies; and the Cool Clip Thermal, a thermal-insulated washable bag to hold formula, milk, a cold teething ring or other warm or cold foods and items. The Super Swap-it Pocket and the Zip-Top Organizing Utility Tote will be on special for customers in September. Customers may get either product, both regularly sold for $35, for just $10 with any $35 purchase. When purchased together during the special, the tote and pocket will cost $45. The Cool Clip Thermal is priced at $15. 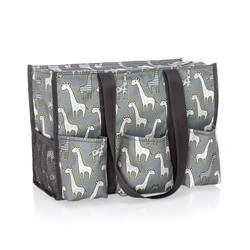 The new print, entitled Go-Go Giraffe, features illustrations of a mother and baby giraffe in neutral grey colors. 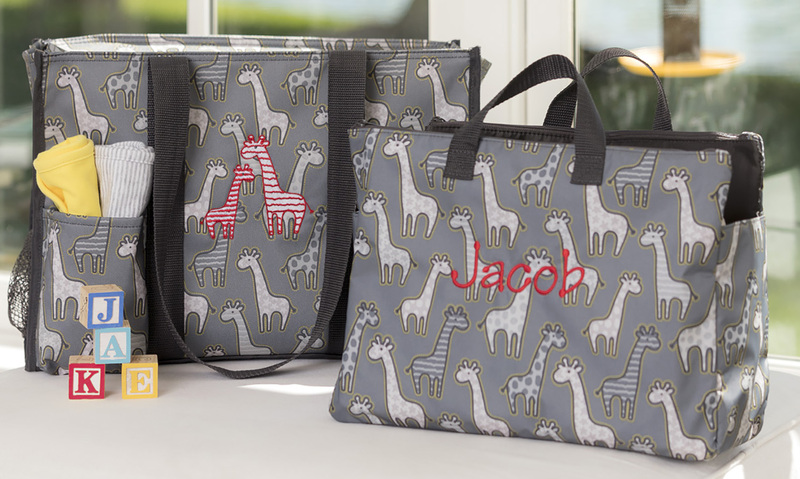 The new icons that can be embroidered onto most of Thirty-One’s products include baby blocks, a mother and baby elephant, and a mother and baby giraffe. In addition to bags, totes and accessories for babies, Thirty-One offers a line of home décor products, including pillows, and storage and organization items that are useful in baby nurseries. The pillows and storage items also may be ordered with the baby icons, and in addition to the icon images, customers may include text with their product personalization, such as a name, initial or phrase of their choice. The personalization is available in any of Thirty-One’s many thread colors. If customers want to add a pop of color or create a bag specifically for a boy or girl, they may use pink or blue thread, for example, to create a baby bag that is more gender-specific. Thirty-One also offers products in solid colors, such as pink, blue and charcoal, that can be personalized with the baby icons in any of their thread colors. Thirty-One Gifts is one of the world’s largest direct-selling companies, offering purses and wallets, totes, home organization solutions and décor, thermal bags, jewelry and more. Products are sold by more than 60,000 independent sales consultants throughout the U.S. and Canada at home parties and online. For more information or to find a consultant, visit their website at http://www.mythirtyone.com. Products can be personalized with baby-themed icons and a word or phrase.